Polar Life: Reborn is a series of film screenings leading up to and during the 50th anniversary of Expo 67 in 2017. Part of In Search of Expo 67, the film is screening at the Musée d’art contemporain de Montréal from June 21 to August 6, 2017. 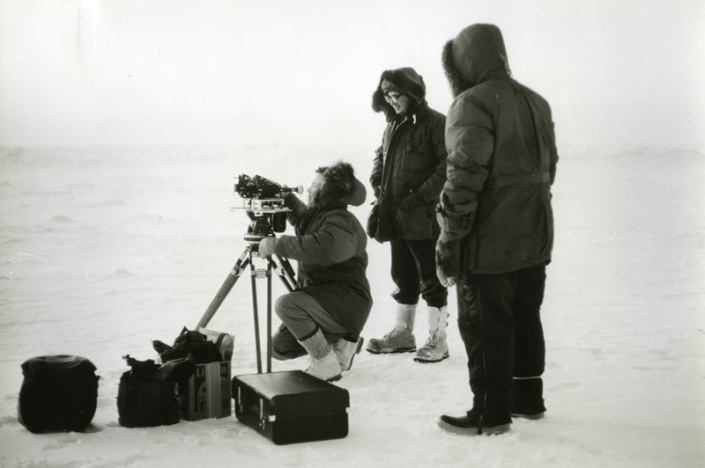 Polar Life was directed by Graeme Ferguson, co-inventor of the IMAX system (with Roman Kroitor and others) that would later be showcased at the World Fair at Osaka in 1970. 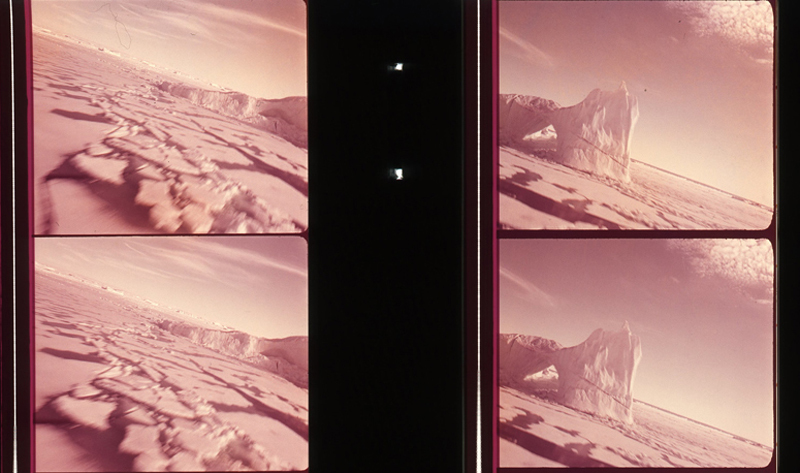 Polar Life is an experimental precursor to the panoramic spatial complexity created in IMAX films, along with Labyrinth. Located within the sprawling “Man the Explorer” Pavilion on Ile St-Hélène, the novelty of Polar Life was its theatre, with its audience seated on a rotating turntable in the middle of eleven fixed screens. Viewers described the intricate juxtaposition of the screen images and narration, and the complex relationship created between moving spectators and multiple screens. The bilingual narration by media personalities, Lise Payette and Patrick Watson, accompany the composition of documentary and archival moving images, showing elaborate temporal and spatial representations of the Arctic and Antarctic regions. Amongst the scenes shown are the Inuit documented in their everyday activities in the Canadian North, northern peoples of Alaska, Lapland, and Siberia, settlers from the south, scientists, explorers, and other inhabitants of the landscape, including reindeer, bears and birds. A candid portrait of the north’s communities, traditions and landscapes emerges. Archival film footage of the Inuit, early northern explorers and the aurora borealis was combined with newly-shot documentary footage by Ferguson during one year of travel in the arctic and antarctic, edited across the various screens to compose sometimes seamless, sometimes juxtaposing spatial relationships. The rotating viewer would experience three screens at one time as they turned within the round theatre in a full rotation of 28 minutes; the full duration of the film screening of Polar Life was 18 minutes. The immersive digital projection installation recreates the pioneering audio-visual experience of the multi-screen film, Polar Life. Using advanced digital technology and a 90-degree curved screen representing 25% of the original circular screens, and three high-definition digital projectors (with edge-blending and warp to create a seamless single image), the digitally-restored film images move across eleven virtual screens that pan horizontally across the physical screen, simulating the visual experience that audiences had sitting in Polar Life’s rotating theatre back in 1967. Historic photographs, architectural plans, a model of the original pavilion, and creative tools used to make the eleven-screen film along with other pieces of memorabilia are exhibited to provide further contextualization. Polar Life’s re-emergence and re-creation at this moment, makes an important contribution to a renewed interest in the geopolitics of the Arctic, and challenges of global warming. 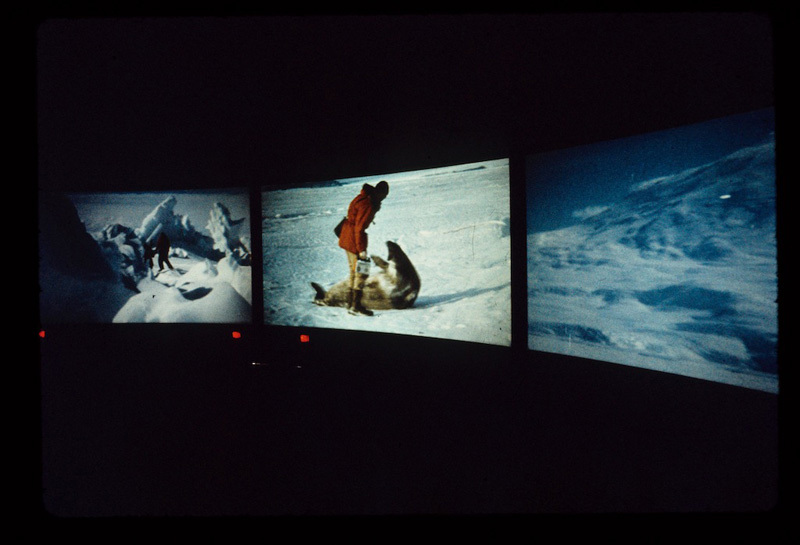 The recreation of Polar Life is a partnership between the CINEMAexpo67 research team of scholars and artists from Concordia and York Universities, who have provided research, curatorial support, and exhibition funding; the Cinémathèque Québécoise (where the original film, deposited by the Ville de Montréal, is being conserved) under the direction of Jean Gagnon, Director of preservation and access to collections; and the National Film Board of Canada, who have undertaken the 4K digitizing of the original elements of the film and digital restoration led by Munro Ferguson, as well as Technical Direction of the installation under the supervision of René Chénier, Producer, Special Projects.